Tied for 14th, just four shots off the lead starting the day, the 23-year old from Holywood crashed unexpectedly to a third round 79 that left him out of the running on five over par - 12 shots behind leaders Angel Cabrera and Brandt Snedeker. It was another nightmare day in golfing paradise for the world No 2, who was just three shots off the lead through six holes but then dropped eight shots in a 10-hole spell from the seventh, racking up crippling sevens at the 11th and 15th in a back nine of 42. “It’s disappointing, especially after such a good start,” said a bitterly disappointed McIlroy after hitting just nine greens. “I was only a few off the lead going into the seventh hole today and then al of a sudden I play from 7 through 11 in 5‑over par and basically my chances in the tournament are gone. Insisting that it was simply the difficulty of the course rather than his strategy that caught him out, he added: “I don’t know what I’m going to do. I feel like I played smart enough. “I hit three‑wood off the first, five‑wood off the second. I mean, I’m playing it the way I know the way you should play it. 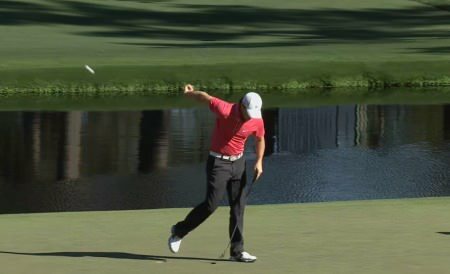 On a day marked by Tiger Woods’ exoneration from disqualification by the Masters tournament committee, McIlroy got off to the perfect start with his first birdie of the day at the third. Just three strokes behind overnight leader Jason Day at that stage, he parred the fifth and sixth but bogeyed the tight seventh for the second time in three days after driving into tree and taking two to escape from greenside sand. Rory McIlroy at Augusta on Saturday.The 450-yard hole is rapidly becoming McIlroy’s bogey hole at Augusta and he is now seven over par for his 17 visits there with just three bogeys against six birdies and two doubles. Having made an eagle three at the eighth on Friday to get back into the tournament, McIlroy had to settle for a mundane par last night before dropping another stroke at the ninth, where he spun off the green, to slip one over. But his Masters hopes ended in a watery grave at the 11th, where he put his third in the water after a poor drive and overshot the green with his fifth shot after a penalty drop. “I got off to the perfect start, one under through six and everything was going well,” McIlroy said. “I made bogey on seven which was fine and then on the back nine made a good two putt on 10 for par. “On 11 I’m hitting wedge for my third after a poor drive and the wind switched on me and I come up short in the water, took seven there and never really recovered from that. “Then the same happened me on 15. I felt like I hit a good second shot in but the wind gusts back into me. It was a sad end to a whirlwind Masters build up for McIlroy, who was not quite at 100 percent with his game having played just seven events with his new clubs. 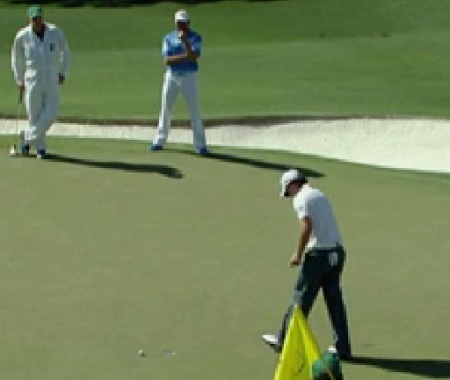 After pars at the 12th and 13th, McIlroy went for broke at the par-five 15th but found water with his approach. 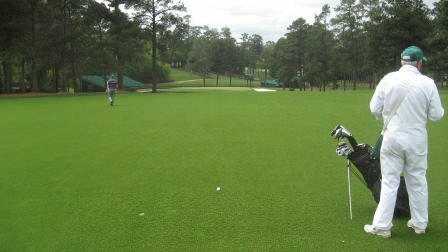 A deft pitch from the drop zone left him a slick 15 footer down the hill but he knocked it seven feet past the hole, three-putting for a seven before tossing his ball backhanded into the pond fronting the green in disgust. “I felt I played well on the first six and everything was going fine. But the margins are so tight on this course and I hit three drives to the right on seven, eight and 11 and paid the price for it,” he added. “I thought I was a bit hard done by on 11 and 15 but that’s the way it goes around here sometimes. “I felt that my strategy was ok and I was coming in here playing well and happy with the way things were going. It’s just that the course played completely differently today to the way it had played the first two days.